Porsche's fourth dealership in B.C. features 22,000 square feet of floor space, including a nine-vehicle showroom and six-bay service area. KELOWNA, B.C. 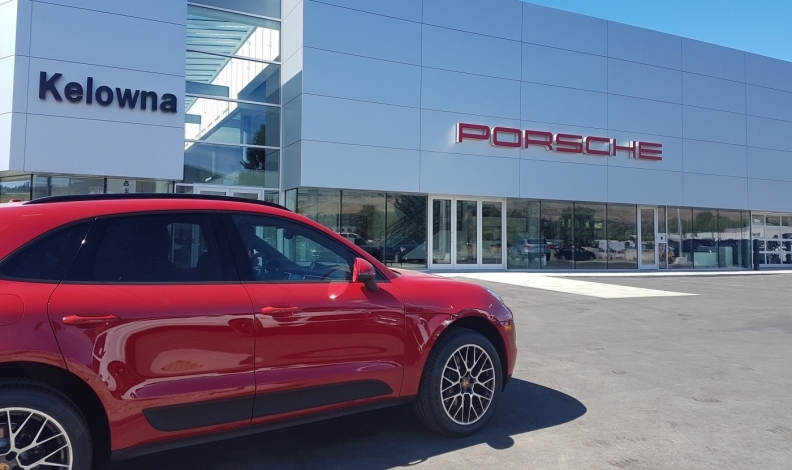 -- Porsche Canada has opened Porsche Centre in Kelowna, in the heart of British Columbia’s increasingly affluent Okanagan region. It's the luxury automaker's 18th Canadian store. The store, Porsche’s fourth in the province, features 22,000 square feet of floor space, including a nine-vehicle showroom and six-bay service area. Only Ontario has more Porsche dealerships with six. The Okanagan is B.C.’s wine country, fruit basket, vacation destination and home to an increasing number of Vancouver-area residents. The latest statistics provided in a 2015 overview of the city found that 85 per cent of residents over the age of 25 had a post-secondary degree, diploma or certificate and the average household income was nearly $75,000. “The Okanagan region of British Columbia has been enjoying a growing number of Porsche customers and fans for a number of years,” Porsche Cars Canada president Alexander Pollich said in a release. Nationally in 2016, Porsche sold an unprecedented 7,061 units in Canada, up 10 per cent over the prior year. Through the first seven months of 2017, the luxury automaker has sold 1,362 vehicles, up three per cent from the year before.